Tom Lehman, winner of the 1996 British Open, says, "Jim Flick understands the overall golf swing better than anyone I've ever met." Jack Nicklaus thinks enough of him to have opened the Nicklaus/Flick Golf School, with teaching facilities in Salt Lake City, Palm Beach, Pebble Beach, Scottsdale, and Harbor Springs (MI). The following golfers -- pro and amateur -- all extol his virtues from tee to green: Arnold Palmer, Tom Watson, Paul Azinger, Phil Mickelson, Judy Rankin, Charles Barkley, Byron Nelson, and Chi Chi Rodriguez. Now, Flick has written a book that's inspirational, instructional and entertaining -- and will take five to ten strokes off even the most casual hacker's game. 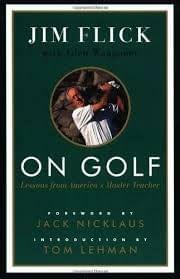 On Golf uniquely captures Jim Flick's method of motivational, one-on-one teaching, which emphasizes his belief that one should play golf, not work it. Whether you shoot 100 and are aiming for 90, or shoot 80 and are aiming for 70, On Golf is the best possible way to make sure that when you play a round of golf, your good walk will never be spoiled.